Wuest: And having seen the multitudes, He went up into the mountain. And when He had seated Himself, His pupils came to Him. The sermon on the mount treats not of salvation, but of the character and conduct of those that belong to Christ—the true yet rejected king. I think Kelly has correctly summarized Jesus' Sermon, because it is literally impossible for the natural man to fulfill His teachings. Only one who is born by and filled with His Spirit has the supernatural ability not just to hear Jesus' words regarding of the moral/ethical principles of His kingdom but to act upon those words (see note Matthew 7:24). Multitudes (3793) (ochlos) means crowd or throng and refers to generally to a multitude or a great number. Here we find another example of not the best chapter break for "the multitudes" described here are referred to in the immediately preceding sentence as "great multitudes" (Mt 4:25). There is no break with the description that begins most logically in Mt 4:23-25 and thus forms a prologue or introduction to Jesus' teaching. The Sermon on the Mount reveals the true standard of righteousness which Christ requires of all who belong to Him (Matthew 5:1). The limitation of the Sermon on the Mount lies in the fact that our Lord reveals His standards for the Kingdom life, without the full revelation of the power by which this standard can be maintained. This fuller revelation would come later. It is similar to the John 7:37-39 passage, where Christ gives His promise of power and fruitfulness before the Holy Spirit has come, through Whom this power is given. The Sermon on the Mount is similar to a plumbline which shows the crookedness of a wall, but does not rebuild it. There are certain general lessons, I suggest, to be drawn from the Beatitudes. First, all Christians are to be like this. Read the Beatitudes, and there you have a description of what every Christian is meant to be. It is not merely the descrip­tion of some exceptional Christians. Our Lord does not say here that He is go­ing to paint a picture of what certain outstanding characters are going to be and can be in this world. It is His description of every single Christian… We are all meant to exemplify everything that is contained here in these Beatitudes. Therefore let us once and for ever get rid of that false notion. This is not merely a description of the Hudson Taylors or the George MacDonalds or the Whitefields or Wesleys of this world; it is a description of every Christian. We are all of us meant to conform to its pattern and to rise to its standard. The second principle I would put in this form; all Christians are meant to mani­fest all of these characteristics. Not only are they meant for all Christians, but of necessity, therefore, all Christians are meant to manifest all of them. In other words it is not that some are to manifest one characteristic and others to mani­fest another. It is not right to say some are meant to be 'poor in spirit, and some are meant to 'mourn, and some are meant to be 'meek, and some are meant to be 'peacemakers, and so on. No; every Christian is meant to be all of them, and to manifest all of them, at the same time. Now I think it is true and right to say that in some Christians some will be more manifest than others; but that is not because it is meant to be so. It is just due to the imperfections that still remain in us. When Christians are finally perfect, they will all manifest all these charac­teristics fully; but here in this world, and in time, there is a variation to be seen. I am not justifying it; I am simply recognizing it… It is impossible truly to manifest one of these graces, and to conform to the blessing that is pronounced upon it, with­out at the same time inevitably showing the others also. The Beatitudes are a complete whole and you cannot divide them; so that, whereas one of them may be more manifest perhaps in one person than in another, all of them are there. The relative proportions may vary, but they are all present, and they are all meant to be present at the same time. Daniel Webster instructed that the following inscription be placed on his tomb "My heart has always assured and re-assured me, that the gospel of Jesus Christ must be a divine reality. The Sermon on the Mount cannot be a merely human production." 1. The Sermon on the Mount (Matthew 5-7) has been long hailed as the sum of Jesus' - or anyone's - ethical teaching. In the Sermon on the Mount, Jesus tells us how to live. a. It has been said if you took all the good advice for how to live ever uttered by any philosopher or psychiatrist or counselor, took out the foolishness and boiled it all down to the real essentials, you would be left with a poor imitation of this great message by Jesus. 2. The Sermon on the Mount is sometimes thought of as Jesus' "Declaration of the Kingdom." a. The American Revolutionaries had their Declaration of Independence. Karl Marx had his Communist Manifesto. With this message, Jesus declares what His Kingdom is all about. b. It presents a radically different agenda than what the nation of Israel expected from the Messiah. It does not present the political or material blessings of the Messiah's reign. Instead, it expresses the spiritual implications of Jesus' rule in our lives. This great message tells us how will we live when Jesus is our Lord. 3. The Sermon on the Mount does not deal with salvation as such, but it lays out for the disciple and the potential disciple how regarding Jesus as King translates into ethics and daily living. a. It can't be proved, but in my opinion, the Sermon on the Mount was Jesus' "standard" sermon. It was the core of His itinerant message: a simple proclamation of how God expects us to live, contrasting with common Jewish misunderstandings of that life. It may be that when Jesus preached to a new audience, He often preached this sermon or used the themes from it. b. It is clear that the Sermon on the Mount had a significant impact on the early church. The early Christians make constant reference to it and their lives display the glory of radical disciples. 4. (Mt 5:1-2) Introduction to the Sermon on the Mount. a. When He was seated: As He preached this message, Jesus was seated. He adopted the customary posture of teaching, as any rabbi in His day - the preacher sat and the audience stood. b. His disciples came to Him … He … taught them: We notice that Jesus primarily speaks to His disciples. 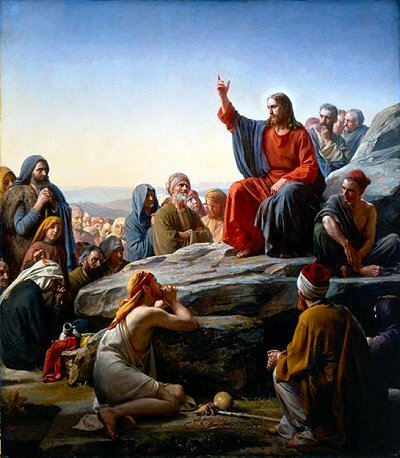 The Sermon on the Mount is directed towards disciples, though others may - and should - hear. By the end of the Sermon on the Mount, people in general hear His message and are amazed (Matthew 7:28). The Beatitudes: the character of kingdom citizens. 1. The first portion of the Sermon on the Mount is known as the Beatitudes, which means "The Blessings" but can also be understood as giving the believer his "be - attitudes" - the attitudes he should "be." a. In the Beatitudes, Jesus sets forth both the nature and the aspirations of citizens of His kingdom. They have and are learning these character traits. b. All of these character traits are marks and goals of all Christians. It is not as if we can major in one to the exclusion of others, as is the case with spiritual gifts. There is no escape from our responsibility to covet every one of these spiritual attributes. Went up (305) (anabaino from aná = up + baíno = to go, come) means to go up, climb, ascend from a lower to a higher place. Some commentaries make what I think is an absurd suggestion that Jesus "went up" to avoid the crowds. Far more likely Jesus "went up" so that He might have a proper "podium" upon which to address the great multitudes and thus all could hear and see Him. Of course, this would be mainly because of the accommodation which the open hill-side would afford to the people, and the readiness with which, upon some jutting crag, the preacher might sit down, and be both heard and seen; but we believe the chosen place of meeting had also its instruction. Exalted doctrine might well be symbolised by an ascent to the mount; at any rate, let every minister feel that he should ascend in spirit when he is about to descant upon the lofty themes of the gospel. A doctrine which could not be hid, and which would produce a Church comparable to a city set on a hill, fitly began to be proclaimed from a conspicuous place. A crypt or cavern would have been out of all character for a message which is to be published upon the housetops, and preached to every creature under heaven. Besides, mountains have always been associated with distinct eras in the history of the people of God; Mount Sinai is sacred to the law… Calvary was also in due time to be connected with redemption, and the Mount of Olives with the ascension of our risen Lord. It was meet, therefore, that the opening of the Redeemer’s ministry should he connected with a mount such as “the hill of the Beatitudes.”… Thank God, it was not a mount around which bounds had to be placed; it was not the mount which burned with fire, from which Israel retired in fear. It was, doubtless, a mount all carpeted with grass, and dainty with fair flowers, upon whose side the olive and fig flourished in abundance, save where the rocks pushed upward through the sod, and eagerly invited their Lord to honor them by making them his pulpit and throne. Sat down (2523) (kathizo from katá = down + hizo = sit) means to seat down, to tarry (not something most of us want to do), or to settle. “Am I eligible to enter Messiah’s kingdom? Would I choose to be. Disciples (3101) (mathetes from manthano = to learn which Vine says is "from a root math, indicating thought accompanied by endeavor". Gives us our English = "mathematics") describes a person who learns from another by instruction, whether formal or informal. Discipleship includes the idea of one who intentionally learns by inquiry and observation (cf inductive Bible study) and thus mathetes is more than a mere pupil. A mathetes describes an adherent of a teacher. As discussed below mathetes itself has no spiritual connotation, and it is used of superficial followers of Jesus as well as of genuine believers. TDNT - mathetes is regularly used in Acts for a Christian as such… As regards the material aspect of the use of mathetes for Christians in Acts, the primary point to notice is that the relevant sections of Acts use it in the sense of those who have come to believe in Christ. In this respect the usage is analogous to that of John’s Gospel. In simple terms a disciple is a follower and so we often see Jesus say "Follow Me!" (Mt 4:19, 8:22, 9:9, 16:24, 19:21, Mk 1:17, 2:14, 8:34, 10:21 Lk 5:27, 9:23, 59, 18:22 Jn1:43, 10:27, 12:26, 13:36, 21:19, 22) And so in the Bible we see that John the Baptist (Mt 11:2; Mk 2:18; Lk 5:33; 7:18; Jn 3:25) had followers or disciples, as did the Pharisees (Mk 2:18, Mt 22:16 disciples of Pharisees were sent to test Jesus) and Moses (Jn 9:28). It follows that it becomes clear that not every use of disciple in the NT describes a genuine believer. On the other hand (although not a popular or common teaching in modern day evangelicalism) the NT makes it very clear that every genuine believer is a disciple of Jesus Christ. In the ancient world a disciple would attach himself to another person in order to gain practical or theoretical knowledge by instruction or experience. It was a word used of apprentices learning a trade as well as students learning a teacher's philosophy. Discipleship was a popular concept among the Jews of Jesus' day. It was often the custom for the disciples to leave their natural home and move in with their teacher, who would provide their food and lodging. The disciple would become his servant and be completely under their teacher's authority. Their goal was to learn all that their teacher knew so that they might become like him in character and later be able to faithfully transmit his teachings to others. Disciples is the term consistently used in the four Gospels to mark the relationship existing between Christ and His followers (Ed: In fact "followers of Christ" is a synonym for disciples of Christ.). Jesus used it Himself in speaking of them, and they in speaking of each other. Neither did it pass out of use in the new days of Pentecostal power. It runs right through the Acts of the Apostles (Ed: Disciples is the most common term for the believers in Acts!). It is interesting also to remember that it was in this way that the angels thought and spoke of these men -- the use of the word (disciple) in the days of the Incarnation is linked to the use of the word in the apostolic age by the angelic message to the women, "Go, tell His Disciples and Peter" (Mark 16:7). Comment: Those who were called His (Jesus') disciples in John 6:60 had simply attached themselves to Jesus, their attachment implying nothing about their sincerity or devotion (see their action in Jn 6:66!). As an aside, note the critical importance of the context in determining the actual meaning of a specific Greek word. Whenever you are performing Greek or Hebrew word studies, you must always examine the context lest you arrive at an incorrect interpretation of the meaning of the word in that specific passage. what He offered, they would not receive!" Vance Havner - Our Lord had no confidence in superficial disciples who did not count the cost. Crowds did not deceive Him. We measure a minister by the size of his crowd, but in the sixth chapter of John the Lord Jesus preached a crowd away! They could not bear His sermon on the bread of life and fell away until only the irreducible minimum of faithful disciples remained, and even they were puzzled. Again in Luke 14:25-33, another multitude followed Him, but He knew they did not mean business, so He turned upon them with that terrific challenge to forsake everything, and with the two illustrations of not counting the cost: the foolish builder, and the king going to war. Sifting church members through that sifter, one finds plenty of chaff today! Vance Havner - Our Lord made discipleship hard and lost many prospective followers because he called them to a pilgrimage, not to a parade—to a fight, not to a frolic. J C Ryle - As the soldier follows his general, as the servant follows his master, as the scholar follows his teacher, as the sheep follows its shepherd, just so ought the professing Christian to follow Christ. Comment: In this passage notice that the Lord Jesus clearly associates belief with discipleship. The verb translated "abide" means to remain or stay (in a given place, state or relation) and introduces a conditional statement which can be paraphrased "If you continue… ". As noted the present tense pictures abiding as the habitual practice of one's life, as the general direction of one's life (not perfection because no one except Jesus abides perfectly). In other words Jesus is saying this is something that remains to be seen. He is saying in essence that if they are truly genuine believers (if they are truly "rooted" in Him so to speak), their "fruit" will demonstrate that they are "the real thing!" What is the "fruit" in this passage? Abiding or remaining in His Word. Jesus is saying that if these "believers" remain or continue in His teaching, then (this is the fulfillment of the conditional sentence) it proves they are genuine disciples, genuine believers. The authentication of a genuine disciple of Jesus Christ is that they will not depart from the Word of God but instead continue in His Word. To continue to abide in His Word in turn means they keep on believing the Word, keep on following the Word and keep on ordering their life according to His Word. Does this sound like works based salvation? One might misread it that way. Jesus is not saying that they merit or gain their status as a genuine disciple by their self effort but that the general pattern of their life of abiding in His Word (including obeying His Word) is made possible because they are new creations, with a new desire for holy things including especially His Holy Word. In other words Jesus is saying that their endurance shows that they are genuine believers, "truly disciples" Jesus. Leon Morris - John is speaking of people who had made an outward profession, but a profession that did not go very deep. Jesus’ words, then, are meant to drive home to formal and casual adherents the meaning of true discipleship. If people in any sense believe in Jesus it is important that they come to see what real faith means… The key word here is “abide” (NIV paraphrases with “hold to my teaching”; the Greek means “abide in my word”). It is easy enough to be superficially attracted to Jesus, but the test is “abiding.” It is only those who continue who are genuine disciples. John MacArthur - Saving faith consists of three elements, commonly referred to by theologians with the Latin terms notitia, assensus, and fiducia. Notitia (knowledge) is the intellectual component of faith. It involves an understanding of the basic biblical facts regarding salvation. Assensus (assent) goes one step beyond notitia and confidently affirms those facts to be true. Fiducia (trust) acts on them by personally appropriating Jesus Christ as the only hope for salvation. John Piper - What this phrase "truly my disciples" implies is that there are disciples who are not truly disciples. The word "truly" means "really"—"really my disciples." In other words, there are real and unreal disciples. There are authentic and inauthentic disciples. There is discipleship that is merely outward, and discipleship that goes down to the root. The world is not just divided into two groups: disciples of Jesus and non-disciples. It is divided into three groups: non-disciples, unreal disciples, and real disciples—people who make no pretense of following Jesus, people that say they follow him and have a surface connection with him, and people who truly follow him. Why did Jesus bring up this distinction? It's disturbing. It makes us squirm and ask ourselves the question which one we are. He brought it up because verse 30 says, "As he was saying these things, many believed in him." There had been a large response to what he was teaching. And whenever there is a large response to anything you may guess that some are being carried along by the crowd. If your friends are going, it's easy for you to go, even if you wouldn't go on your own. You are along for the ride. So Jesus doesn't assume that all this belief is real. What he does is give a test that we can use to see if we are real. And in giving us this test Jesus helps us be real. It is not just a test of reality. It is a pathway to reality. is the same as "true Christian"
Jesus is not saying that "true disciple" is a second stage in the Christian life. First believer, and then later you attain the level of disciple. There have been ministries who talk that way. First, you're an unbeliever, then you are a believer, then you grow into a disciple, and then you are a disciplemaker. That is not the way Jesus thought. And one piece of evidence for saying this is to notice the words he uses here in verse 31: "Jesus said to the Jews who had believed in him, 'If you abide in my word, you are truly my disciples." He did not say to these professing believers, "If you abide in my word, you will become truly my disciples." In other words, He did not teach that being a true disciple was a later stage after simple belief. No. He said, "If you abide in my word, you are truly my disciples." Now that you have believed, here is how you can know what you now are. You can know if your belief is real: You are now my true disciples if you go on abiding in My word. So there is no thought here about "true discipleship" being a second stage of Christian maturity. truly forgiven for your sins. of the genuine Believer . and let it hold you fast. First, believe Him, believe Him to be true, believe Him to be sent of God for your salvation—and then put yourself into His hands. When you have committed yourself to Him, continue to do so. Do not run away from your faith because of ridicule. Mind that you so believe in Jesus as to practice what He commands—you cannot continue in His Word unless you learn to obey it. The test of faith is obedience . What He bids you, do it. Let your life be affected by the Truth He teaches. Let your whole mind, thought, desire, speech, bearing and conversation be colored and savored by your full faith in Jesus! Enter into His Word as a man into a stream and live there as a fish in the water! “Continue in My word.” Get into Christ’s Word as a sinking sailor would get into a lifeboat and, once there, keep inside the boat—do not throw yourself out into the stormy waves through despair—but continue in the place of hope. This is Christ’s gracious counsel to those in whom there seems to be some hopeful sign. Hendriksen - One abides in the word of Christ by making it the rule of one’s life. In other words, obedience is the same thing as abiding in the word. This makes one a true disciple of Jesus and leads to genuine knowledge of the truth (God’s special revelation which has its heart and center in the work of Christ). J Vernon McGee - Faith alone saves, but the faith that saves is not alone. It will produce something. After a person believes on the Lord Jesus Christ, he will want to “continue in His Word.” The proof of faith is continuing with the Savior (Ed: From John 8:31 continuing with the Savior means to continually "abide in My Word" and this is the "descriptive definition of a disciple. Are you a genuine disciple of Jesus?). As the pastor of a church, I learned to watch out for the person who is active in the church but is not interested in the study of the Word of God. Such a one is dangerous to a church. It is notable that Luke uses mathetes repeatedly to describe believers in the book of Acts. In fact the most common term used for believers in Acts is mathetes or disciples, not believers or Christians. Those who teach that disciples of Jesus were a special class of believers and that not all believers are disciples need to explain the book of Acts (Acts 1:15KJV, Acts 6:1, 2, 7, 9:1, 10, 19, 25, 26, 38, 11:26, 29, 13:52, 14:20, 14:22, 28, 15:10, 16:1, 18:23, 27, 19:1, 9, 30, Acts 20:1 Acts 20:30 Acts 21:4 Acts 21:16. True discipleship is obeying Jesus Christ and learning of Him and following Him and doing what He tells you to do, keeping His commandments and carrying out His will. That kind of a person is a Christian—and no other kind is. Matt 5:1; 8:21, 23; 9:10f, 14, 19, 37; 10:1, 24f, 42; 11:1f; 12:1f, 49; 13:10, 36; 14:12, 15, 19, 22, 26; 15:2, 12, 23, 32f, 36; 16:5, 13, 20f, 24; 17:6, 10, 13, 16, 19; 18:1; 19:10, 13, 23, 25; 20:17; 21:1, 6, 20; 22:16; 23:1; 24:1, 3; 26:1, 8, 17ff, 26, 35f, 40, 45, 56; 27:64; 28:7f, 13, 16; Mark 2:15f, 18, 23; 3:7, 9; 4:34; 5:31; 6:1, 29, 35, 41, 45; 7:2, 5, 17; 8:1, 4, 6, 10, 27, 33f; 9:14, 18, 28, 31; 10:10, 13, 23f, 46; 11:1, 14; 12:43; 13:1; 14:12ff, 16, 32; 16:7; Luke 5:30, 33; 6:1, 13, 17, 20, 40; 7:11, 18; 8:9, 22; 9:14, 16, 18, 40, 43, 54; 10:23; 11:1; 12:1, 22; 14:26f, 33; 16:1; 17:1, 22; 18:15; 19:29, 37, 39; 20:45; 22:11, 39, 45; John 1:35, 37; 2:2, 11f, 17, 22; 3:22, 25; 4:1f, 8, 27, 31, 33; 6:3, 8, 12, 16, 22, 24, 60f, 66; 7:3; 8:31; 9:2, 27f; 11:7f, 12, 54; 12:4, 16; 13:5, 22f, 35; 15:8; 16:17, 29; 18:1f, 15ff, 19, 25; 19:26f, 38; 20:2ff, 8, 10, 18ff, 25f, 30; 21:1f, 4, 7f, 12, 14, 20, 23f; Acts 6:1f, 7; 9:1, 10, 19, 25f, 38; 11:26, 29; 13:52; 14:20, 22, 28; 15:10; 16:1; 18:23, 27; 19:1, 9, 30; 20:1, 30; 21:4, 16. Limitations of space preclude us from going through every NT use of mathetes but below are selective uses that help us understand the meaning of this great word. Comment: Here Jesus gives His clear instruction on how we are to make disciples. A disciple is to learn from his teacher, so that when his training is complete, he will be like his master. Notice that likeness, not simply greater knowledge, is the goal of discipleship. Ultimately the likeness should be to Jesus, Who Himself is the goal God desires for all His children in training (Ro 8:29, cp 2Pe 3:18). Illustration - Making Disciples, A Perishable Art -- After a distinguished performing career, virtuoso violinist Jascha Heifetz accepted an appointment as professor of music at UCLA. Asked what had prompted his change of career, Heifetz replied: “Violin playing is a perishable art. It must be passed on as a personal skill; otherwise it is lost.” We need to listen to this great musician. Living the Christian life is a highly personal experience. We can’t pull it off merely by watching skilled veterans “perform.” We need hands-on instruction. Comment: A fruitless disciple of Christ is a contradiction in terms. If there is no real fruit in our lives (eg Gal 5:22, Gal 5:23), we cannot claim to be disciples of Jesus for fruit-bearing demonstrates that we are one of His disciples (cp Mt. 7:20; Luke 6:43, 44). The purpose of our fruit bearing is to give a visible picture if you will which points clearly to the invisible God. As MacDonald puts it "People are forced to confess that He must be a great God when He can transform such wicked sinners into such godly saints." Note the progression in John 15 - no fruit (John 15:2), fruit, more fruit, much fruit (John 15:5, 8). To the Jews in Jerusalem, the name "Christ" was a title, meaning "the anointed one," the Jewish Messiah. However, the Greek-speaking believers in Antioch were called "disciples" more often than believers and they soon became known as followers of Christ, or Christians, and this has been customary ever since. Comment: This is one of the great (if not the greatest) evidences of a true disciple of Jesus and also one of the greatest witnesses to the lost world. Given that this quality of love is supernatural, it follows that it can only be produced by a supernatural source or power and in fact is the fruit a disciple bears as they are filled with (~ "controlled by" like wine controls the one it fills! = Eph 5:18-note) and walk by the Spirit (Gal 5:16-note) (believing this truth, submitting to this truth, acting on this truth), for that is the way the Master Teacher walked, not in His own power (He "emptied" Himself - cp Phil 2:5, 6, 7-note= We are to "empty" ourselves of our self reliance,) but in the filling with, leading by and power (dunamis = inherent ability and in this context ability to accomplish a supernatural task) of the Holy Spirit. (see Luke 4:1, 2, 14). In Jn 8:31 Jesus gives "abiding" as a requisite of a disciple and in 1John 2:6 we read that "the one who says he abides in Him ought Himself to walk in the same manner as He walked." (1Jn 2:6). How did Jesus walk (live, conduct His life, behave)? In submission to the Father and empowered by the Holy Spirit. We can do no less, if we expect to bear God glorifying, Christ exalting supernatural agape love which is the defining mark of Jesus' disciples. This begs the question dear follower of Christ, are you walking in your strength or are you learning to walk in the strength of the Spirit of Christ (Ro 8:9-note), Who indwells you continually, Who is Jesus' promised "Gift" to help us in our time of need (and we are always in need of His power to live a supernatural life)? Leon Morris - Now we have the other truth that God is also glorified in the work of believers who abide in the Son. There is an air of completeness and of certainty about it. The disciples will surely glorify the Father by their continual fruit-bearing; since they cannot bear fruit of themselves (Jn 15:4) their fruitfulness is evidence of the Father at work in them and thus it glorifies him… It is not without its significance that the disciples are to be known by their love, the world by its hatred (Jn 15:17, 18). Comment - The phrase "come after Me" is clearly used in the sense of becoming a disciple of Jesus, following His instruction and entering into fellowship with Him. To deny self is a command to lose sight of one's self and one's own interests. but it costs more not to! Dietrich Bonhoeffer - When Christ calls a man, He bids him come and die. It may be a death like that of the first disciples who had to leave home and work to follow Him, or it may be a death like Luther’s, who had to leave the monastery and go out into the world… Cheap grace is grace without discipleship, grace without the cross, grace without Jesus Christ, living and incarnate. Go therefore and make disciples (the only specific command in Jesus' commission)… teaching (didasko in the present tense = continually instructing) them to observe (tereo in the present tense = continually keeping Jesus' teaching in view with the nuance here of to keep, just as in Jn 14:15 [where keep = tereo]) all that I have commanded you” (Mt 28:19-20). Comment: Jesus' "Magna Carta" command was to make learners by going, baptizing, teaching. As noted above, the Greek word mathetes ("disciple") is from the verb manthano ("to learn") emphasizing that the essence of a disciple is a pupil or learner. In Greek culture prior to Socrates, manthano described the process by which a person sought knowledge. A mathetes was one who attached himself to another to gain some practical or theoretical knowledge, whether by instruction or by experience. The word came to be used both of apprentices who were learning a trade and of adherents of various philosophical schools. After the time of Socrates, the word lost favor with the philosophers, who were not at all happy with its association with labor. The concept of discipleship was popular in Jesus' day for most rabbis had disciples who studied with them in a well-defined and special relationship. In 1983 a fifty-year-old tradition was quietly dropped by the U.S. House of Representatives. The tradition involved the annual reading of George Washington’s farewell address on the occasion of his birthday. Democratic and Republican leaders decided it was useless to continue to read the lengthy address to a mostly empty chamber. “It’s too bad,” said GOP aide, “but it’s time for this to be consigned to the dustbin.” Stated “The Calgary Herald”: “In past years, it was almost holy writ that the address must be read. Through war and storm for half a century, a member of each chamber has been chosen to read the address.” Declared the newspaper heading, “Nobody listens to Washington’s farewell address.” We are afraid that something parallel to this is taking place in the Christian church. Fewer and fewer believers are listening to Christ’s farewell message. To His disciples Christ gave clear instructions - to go to all nations with the Gospel and there to make disciples. That means that the mission of the church and the goal of evangelism is to make disciples. "Disciple" in the book of Acts (Acts 6:1-2, 7 11:26 14:20, 21-22 15:10) virtually always refers to a saved person. Jesus warned all who thought of becoming disciples to count the cost carefully. (Lk 14:28-30). The call to discipleship explicitly demands full commitment, with nothing knowingly or deliberately held back. Whoever does not carry his own cross and come after Me cannot be My disciple. (Lk 14:27). Comment: Bearing a cross does not mean primarily having hard times. It means going to Golgotha. It means dying with Christ—dying to the old attitudes of envy and strife and jealousy and anger and selfishness and pride; and turning to follow Jesus in newness of life. When we make disciples, we bid people to come and die to their old, destructive ways and to live for Jesus, Who loved them and gave Himself for them… When a person becomes a disciple of Jesus, he relates in a new way to the entire Godhead. The Father becomes our heavenly Father, the Son our Lord, the Spirit our indwelling enabler. (Ed comment: Clearly Dr Piper sees a believer and a disciple as synonymous terms). I once was asked to do a series of messages on Christian discipleship, and the first question I dealt with was this: "Is discipleship necessary?" I began by explaining the way the question needs to be interpreted. It should not mean, "Is discipleship necessary if we are to be obedient to Jesus?" That is obvious. Nor should it mean, "Is discipleship necessary in order to live a full and happy Christian life?" That should be obvious, too. What the question should mean (and the sense in which I treated it) is, "Is discipleship necessary for one to be a true Christian? Can you be a saved person without it?" The answer I gave, the answer that should be given by any true Bible expositor, is, "Yes, it is necessary! It is mandatory to follow after Christ to be a Christian." Comment: Note Boice's use of the phrase "follow after" - at the church I now attend I have been struck with the fact that all of the pastoral staff routinely refer to believers as "Christ followers." Salvation is free. The gift of God is eternal life. It is not cheap for it cost God His Son and the Son His life, but it is free. However, when we become believers we become disciples and that will cost everything we have… our Lord was after disciples, not mere "joiners." Make disciples (3100)(matheteuo) This is the verb form of mathetes and is found 4 times in the NT. Intransitively, the verb means to be the disciple of another, to follow his precepts and instruction, to be a pupil of another implying one is an adherent of the teacher. Transitively, matheteuo means to make a disciple of someone, to cause them to be a pupil, to teach or instruct them. Give a man a fish, and he eats for a day; teach him to fish, and he eats for the rest of his life. Comment: This is the very reason I strongly encourage you to learn and practice the discipline of inductive Bible study, for in so doing you will be equipped to "feed yourself" for the rest of your life on earth! Matthew 27:57 When it was evening, there came a rich man from Arimathea, named Joseph, who himself had also become a disciple of Jesus. Chrysostom says that He taught them even when He did not open His mouth; His very silence was instructive. But when He did open His mouth, what streams of wisdom flowed forth! “How could he teach without opening his mouth? “to which the reply is that he very frequently taught, and taught much, without saying a word, since his whole life was teaching, and his miracles and deeds of love were the lessons of a master instructor. It is not superfluous to say that “He opened his mouth, and taught them,” for He had taught them often when His mouth was closed. Besides that, teachers are to be frequently met with who seldom open their mouths; they hiss the everlasting gospel through their teeth, or mumble it within their mouths, as if they had never been commanded to, “cry aloud, and spare not.” Jesus Christ spoke like a man in earnest; He enunciated clearly, and spake loudly. He lifted up His voice like a trumpet, and published salvation far and wide, like a man who had something to say which He desired His audience to hear and feel. Oh, that the very manner and voice of those who preach the gospel were such as to bespeak their zeal for God and their love for souls! So, should it be, but so it is not in all cases. When a man grows terribly in earnest while, speaking, his mouth appears to be enlarged in sympathy with his hearers: this characteristic has been observed in vehement political orators, and the messengers of God should blush if no such impeachment can be laid at their door. Began to teach (1321)(didasko from dáo= know or teach; English = didactic; see study of related noun didaskalia and the adjective didaktikos) means to provide instruction or information in a formal or informal setting. In the 97 NT uses of didasko the meaning is virtually always to teach or instruct, although the purpose and content of the teaching must be determined from the context. Began to teach is imperfect tense which describes the teaching as in progress. It pictures the teaching as going on, over and over so to speak. Spurgeon warns "Do not fall into the mistake of supposing that the opening verses of the Sermon on the mount set forth how we are to be saved, or you may cause your soul to stumble. You will find the fullest light upon that matter in other parts of our Lord’s teaching, but here he discourses upon the question, “Who are the saved?” or, “What are the marks and evidences of a work of grace in the soul?” Who should know the saved so well as the Savior does? The shepherd best discerns his own sheep, and the Lord himself alone knoweth infallibly them that are his. We may regard the marks of the blessed ones here given as being the sure witness of truth, for they are given by him who cannot err, who cannot be deceived, and who, as their Redeemer, knows his own. "Blessed is the man that walketh not in the counsel of the ungodly, nor standeth in the way of sinners, nor sitteth in the seat of the scornful: but his delight is in the law of the Lord." --Ps 1:1-2. OUR LORD lived inside the City of Blessedness, and in Matthew 5:1-12 He reveals to all men the eight gates by which that City may be entered. For myself, I cannot go in by the Gate of Poverty of spirit, for I am not humble enough; nor by the Gate of the Mourners, for I am not grieved enough for my own sins or the sins of others; nor by the Gate of the Meek, for I often resent injury; nor by the Gates of Mercy, or Purity, or Peace. But I may claim to enter by the fourth Gate, for I Hunger and Thirst after Righteousness. And as I go in, I find myself inside the City, and in the company of all holy souls that have entered by the other gates. For in the Heavenly City, to enter by any gate is equivalent to having entered by all; and one grace which is inwrought by the Holy Spirit will ultimately lead on to all the rest. What is Blessedness? According to our Lord's teaching, it is a condition or state of heart. Outward circumstances are not mentioned, unless it be reproach and persecution, as though they were matters of indifference. Blessedness is altogether independent of our outward lot, whether prosperous or perplexed, rich or poor. Blessedness begins and ends with a contented recognition of the Royalty of Christ's Kingdom; in the power of seeing the good in everything, and so inheriting the earth; in being satisfied, in obtaining mercy, in seeing God and being called His sons and daughters. Is it not worth while to strive to enter in at these wide-open doors? And if you can say that you really do yearn after better things, hungering and thirsting for more likeness to Christ, and more fitness for His Kingdom; if that desire really represents the purpose of your life, you may account yourself as being already admitted within the Gates of the Blessed Life. We must not suppose that Our Lord allocated the award of Blessedness to the possessors of certain attributes with an arbitrary and royal prerogative. He simply declared what was true in the very nature of things. To be true, pure, merciful, and meek, is to have in your possession the seed-germs of the harvest of Blessedness. If you turn from this wonderful enumeration of Christian qualities to Galatians 5:22, you will find all of them set forth in the list of the fruit of the Spirit. May He work in us and through us a well-balanced and full-orbed Christian character. PRAYER - Lord, take my lips, and speak through them; take my mind, and think through it; take my heart, and set it on fire. AMEN. THERE is a condition of soul which may be experienced and enjoyed by every child of our race, which the Master calls Blessedness. He uses the same words to describe it as is employed to set forth the Being of God and the Life of the Saints who have passed beyond the vail. Blessed are ye (Matt. 5:11). The glorious Gospel of the Blessed God ( 1 Tim. 1:1). Blessed are the dead which die in the Lord (Rev. 14:13). This condition of soul, however, need not be postponed until we too, in our turn, pass the Gate of the City, and find ourselves amid "the solemn troops and sweet societies" of eternity. It may be entered here and now. The fragrance of this garden steals through the crowded and noisy cities of our modem civilization like the morning air laden with the scent of new-mown grass. The gates of this city stand open, night and day, for lonely souls, in country and sequestered places, where the noise of our city life cannot reach, and at any moment they may tread its thronged streets, listen to its murmured speech, and join in its vast convocations, of which it is written: "Ye are come to Mount Sion, the City of the Living God, to myriads of angels, to the general assembly and church of the firstborn." Blessedness does not depend on outward possessions, such as worldly goods, or lands, or high birth, or erudite culture. Indeed, there are words of Christ which suggest that they who stand possessed of these things will find it harder to enter that Paradise which has not yet faded from our world, and to pass through the gates of that city which are before our eyes, if only they were opened to discern them. When He repeated this Sermon of the Mountain-Heights and of the Dawn, to the multitudes that stood breathless beneath its spell, He said, "Woe unto you that are rich … Woe unto you that are full … Woe unto you, ye that laugh." He did not mean that such would be necessarily excluded, but that entrance into blessedness would be harder for them; as when, after dusk, a camel strives to get through the needle-eye-gate, placed in the city wall for belated pedestrians. There is no soul of man so illiterate, so lonely, so poor in this world's goods, so beset with hereditary sins and demoniacal temptations, that may not at this moment step suddenly into this life of blessedness, begin to drink of the river which makes glad the city of God, the holy place of the tabernacles of the Most High. It is not necessary to ascend into Heaven to bring it down, or to descend into the Depth of the Abyss to bring it up; it has not to be wrestled or wept for; it is not to be obtained by the merit of holy deeds or as the guerdon of devoted service; it is not a reward which comes after long years in the council chamber or on the tented field. We have not to do, or feel, or suffer, but only to be; to cultivate certain dispositions; to possess a nature, here carefully defined, and instantly blessedness begins, an earthly light breaks on the soul, which is destined to increase into the full radiance of Heaven's high noon. "Come in, thou blessed of the Lord" (can you not hear the angel-voices? ); "wherefore standest thou without?" Our Master did not speak of this condition of soul by hearsay; for thirty years it had been His sweet and deep experience. During His life in Nazareth had not the Lamb of God lain in His Father's bosom? Had He not realized that He was wrapped around with the love which had been His before the worlds were made? Had He not been content to let the great ones of the world go on their way of pomp and pride, because He was assured of a deeper joy, a more perfect peace, a more satisfying happiness, than Caesar's smile or the Imperial purple could afford? The well of water was springing up in His own pure heart before He spoke of it to the woman at Sychar's well. He knew the Father, loved the Father, fulfilled His Father's behests, rested in the Father's will, was encompassed with the perpetual sense of the Father's presence, breathed the sunny air of the Father's love. During His earthly life, as He confessed Himself, the Son of Man was, therefore, already "in heaven" (John 3:13). He offers us what He was experiencing for Himself. "My peace I leave with you; My peace I give unto you." "These things have I spoken unto you, that My joy might remain in you." "That the love wherewith Thou lovest Me may be in them." Not to the same degree, but after the same quality and kind, we may know in this life, amid difficult, tempestuous, and sorrowful experiences, what the Lord felt when He said: "He that sent Me is with Me; the Father hath not left Me alone, for I do always those things which please Him." First, it is blessed to belong to that invisible Kingdom which is already in our world, including within its ever-expanding circle all gracious souls of every race and age, breathing the ozone of Heaven into the stale and exhausted atmosphere of the world; its King the Enthroned Lamb; its subjects, the childlike, the forgiving, the gentle, and the pure; its laws, love; its advances, soft, sweet, irresistible as the dawn; its duration, eternal. It is a blessed thing to know that one has the franchise and freedom of that kingdom, that one need never go out from its holy and strong embrace, and that men like John the Divine may greet us thus: "Your brother and partaker with you in the Kingdom, which is in Jesus" (Rev. 1:9, R.V.). Second, it is blessed to be comforted with the comfort which only God can give. When the eyes are wet with tears that refuse to be staunched, to feel a hand soft and strong wiping them away, and to discover that it is the Hand. And hears Calvary's mark on its pierced palm." When the face is buried deep amid the dried flowers and leaves of departed joys, to hear a whisper which thrills the sense, growing fuller and clearer, like a flute, and to detect in its syllables the assurances of the Comforter Himself; when the sepulchre seems to hold all that made life worth living, to become suddenly aware that there is a presence near at hand, and to find that the Gardener Himself is at hand to lift the drooping plant of life, unfurling its petals again to the light; to be strong in God's strength, comforted with the paracletism of the Paraclete, to drink of the brook by the way, here is blessedness which eye hath not seen, neither the ear of ordinary men heard, nor the unregenerate heart perceived. Even the bereaved and lonely heart, sitting amid the wreckage of all its joys and hopes, may be aware of this. There is a new rapture in common sights, a new meaning in common sounds; lilies are robed more sumptuously than Solomon; the winged and furred denizens of the woodlands become, as St. Francis found them, "little brothers and sisters." As Cowper said, such a man may be poor compared with those whose mansions glitter in his sight, but he calls the luxuriant prospect all his own. Every wind wafts him blessing; all things work together for his good. Whether Paul, or Apollos, or Cephas, or the world, or life, or death, or things present, or things to come, all things bring their tribute to the man who has learnt Christ's secret, which, like the fabled philosopher's stone, turns everything into gold. What inheriting the earth means is shown in the words of one of Christ's most proficient pupils, when he said: "I have learned in whatsoever state I am therewith to be content." You may own vast estates, and get nothing from them. You may have no rod or perch of land, and yet you may derive joy and delight from every scene, and extract nutriment from every incident. Newspapers, public events, journals, travels, pictures, architecture, literature, human life, all shall minister to your joy and perfecting. Fourth, it is blessed to be filled. In this life, as well as in the next, it is possible to hunger no more, neither thirst any more. Not to hunger for the husks that the swine eat, because filled with the provisions of the Father's table! Not to thirst for the heated pools at which the children of the world seek to quench their thirst, because the well of water; that springs up to eternal life, is within! Not to clamour for the fleshpots of Egypt, because there is so plentiful a provision of manna. Oh, it is a blessed thing to be filled with the Spirit, to be full of joy and peace, to be fulfilled with God's grace and heavenly benediction, to be filled with the fruits of righteousness, to be filled with the knowledge of His will, to be filled unto the fulness of God. Tennyson says that the babble of the Wye among the hills lasts until the tidal wave fills up its channels to the brim; and the heart is restless till it is full, but when it has realized this blessed fulness, dipped deep into the fulness of God, and lifted out dripping with flashing drops, ah, then, evil has no lure to charm, the fear of man cannot intrude, the charms and blandishments of sense are neutralized. What more can the soul want than to be filled with Thee, O God, who didst make us for Thyself? Cannot a flower be satisfied which has a sun to shine on it, and a glacier-fed river to wash its roots? We need mercy from little children, startled by our harsh tones; mercy from our servants and employees, hindered by our inconsistencies, our quick temper, and imperious tones; mercy from husband or wife, brother or sister, neighbour or friend, above all, mercy from the Most Merciful; and it is blessed to know that we have it in Heaven's own measure, full, pressed down, and running over. So far from it making us lax in permitting sin, it predisposes us to more mercy towards the failings of others, more mercilessness to ourselves. Sixth, it is blessed to have the vision of God. Not to terrify, as when Moses hid his face, and Elijah went into the covert of the cave, and John fell at his feet as dead; but more after the fashion of Mr. Hewitson's experience, when he says: "Our Redeemer is no mere abstraction, no ideality that has its being only in our shifting thoughts, He is the most personal of all persons, the most living of all who live. He is 'the First and the Last, and the Living One.' He is so near us, as the Son of God, that we can feel His warm breath on our souls; and as the Son of Man He has a heart like these hearts of ours, a human heart, meek and lowly, tender, kind, and sympathizing. In the Word, the almost viva voce utterance of Himself, His arm of power is stretched forth beside you, that you may lean on it with all your weight; and in the Word, also, His love is revealed, that on the bosom of it you may lay your aching head, and forget your sorrow in the abundance of His consolation. To the Living One who died we must look that we may be weaned and won over to God, that we may be strengthened, spiritualized, and sanctified." Who would not desire a life like this, in which God should be the one dear Presence, the one familiar and ever-present object of thought, the Friend with whom an increasing dialogue is maintained. A young girl employed in a shop told me the other day that her consciousness of God and her converse with Him had now lasted for three years, and that difficult things had become easy, as though He arranged all and smoothed out the creases. Seventh, it is blessed to be recognized as the son of God. Some are undoubtedly children of God, who are not like God. It would require a good deal of scrutiny to detect His image and superscription on their face, or the tones of His voice in their speech. The manners of the Heavenly Court are not evident in their demeanour; the courtesy and thoughtfulness that characterized the Son are not characteristic of their behaviour to the poor and timid, to little children and women. They too often break the bruised reed and quench the smoking flax; they strive and cry and cause their voices to be heard in the street; they do not bear, believe, hope, and endure all things, and elicit the love of men to Him whose name and nature they bear in every lineament. Be it ours to be imitators of God as dear children, to be harmless and blameless, the sons of God, without rebuke, to be thus is to be blessed. Eighth, we come back to the Kingdom of Heaven. For blessedness is like a spiral staircase, we are always coming back to the same standpoint from a higher position on the circling round. When we begin to live for God we find ourselves in the Kingdom, and are ravished with the beauty of the dawn; but after years have been spent in doing His will and walking in His fellowship there is a new depth of loveliness and significance in its infinite and Divine contents.